CES is run by the Consumer Technology Association, the US trade group for technology companies, and it’s a combination of a massive trade show and a conference presenting experts on various topics. Since the CTA is not exactly an unbiased observer, it’s always a good idea to be on the lookout for excessive optimism and rosy projections—few people here are willing to suggest that a technological utopia is not right around the corner. So I always attend the CTA’s kickoff session of projections for the year with a skeptical eye. They’re always reliable for accuracy regarding past and present statistics, but a grain of salt is warranted for everything else that’s said. It’s a bit off-message when a presentation on our fantastic 5G future is held in a hotel where the Wi-Fi is capped at 512 Kbps. Any disparaging or questioning commentary in this article is my language, and not taken from the stage. An example of this optimism was the introduction to the talk, which said that this year was the culmination of breakthrough technologies reaching the mass market, ranging from 8K televisions to AI. We are supposedly nearing the end of the connected age where we concentrated on connecting people to each other, and are moving into the data age where consumer behaviors drive both the technology we use and every business model behind it. In the data age, we will concentrate on connecting things to each other in large quantities—thousands of tiny sensors over 5G, vehicles with AI to the surrounding infrastructure, and security cameras to servers that will understand the context of the video. Many technologies are on deck that will be components of this process. 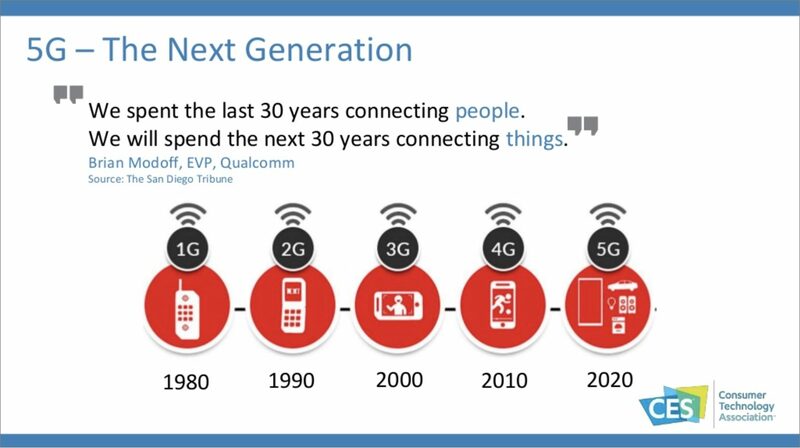 5G is genuinely coming in a year or two, although deliberately deceptive marketing will make it seem sooner, and it combines faster Internet speeds with the capability to network orders of magnitude more devices. Siri may still have its egg freckle moments of misunderstanding, but voice interaction is now the primary (or only) way we interact with many devices. These recognition systems aren’t just technologies, they’re platforms—Alexa has 60,000 “skills” it can learn to interact with devices not made by Amazon. The result is that there is an astonishing number of things you can do by ordering your gadgets around, but you still have to remember how to talk to your HomePod, and how that might be different with an Echo Dot. 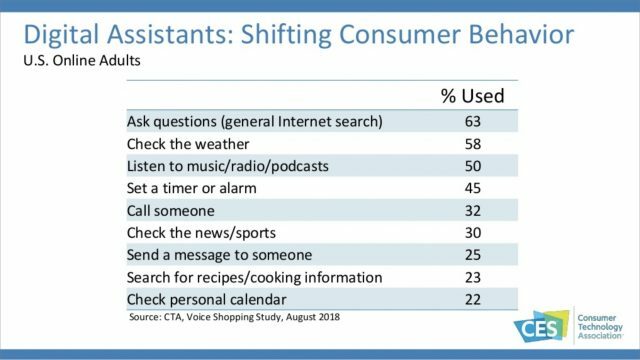 Perhaps that’s why, even though up to two-thirds of respondents to a CTA poll said they used voice interfaces, all of the uses listed in the poll are things you could do with one or two taps on your phone—dictation is the only usage that stretches beyond that. That’s largely due to limitations on what AI can do, but it’s also due to limitations on what we’re comfortable with AI doing. Many people were startled when Google announced its Duplex system for making reservations with actual humans, including programmatic “ums” and “ahs” to fool the receptionist into thinking they were talking to a member of their own species. Domino’s trialed an autonomous car for delivering pizza, only to discover that their customers didn’t like leaving the house to walk to the curb to fetch their order. Part of this, I think, comes from losing sight of what’s providing value to the customer. The delivery person at your door might cost a few bucks in tips, but you can tell them immediately that you ordered a Diet Pepsi when they hand you an orange soda. 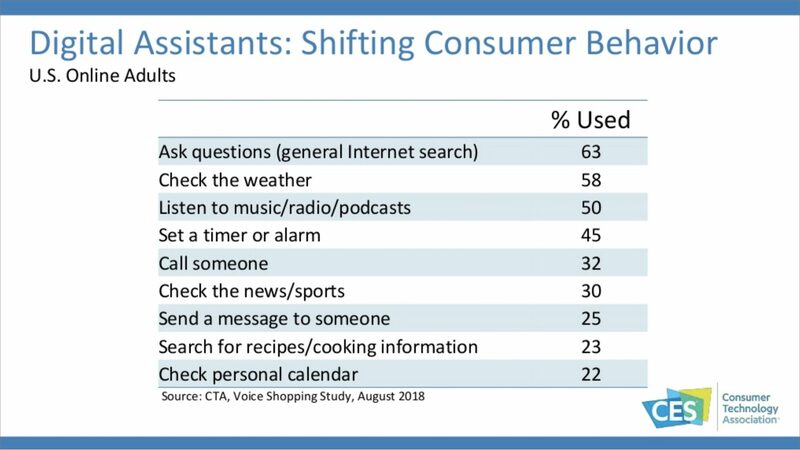 This is also exemplified by another slide titled, “Is this the year of the smart appliance?” Without saying it outright, CTA is referencing the prior years that were definitely supposed to be that year. I’m unclear what the value is to buying a $1000 smart fridge versus a $400 dumb one since I can use a few phone apps to provide kitchen smarts. And those apps can be updated or replaced easily. More successful is the continuing expansion of television inches and resolution, as the average television size has gone from 22 inches in 1997 to 48 inches today. Many manufacturers will be releasing 8K sets this year: while they might not technically be 8K (the standard is 7680 by 4320), they still put 33 million pixels in front of your eyeballs. You’re not going to see the difference between 4K and 8K unless you get a set that’s 65 inches or larger—and as that’s larger than many living rooms can handle (let alone bedrooms), it’s expected that many people will never get there. Of course, you’ll also need providers to give you 8K video. For the moment you’re out of luck unless you live in Japan, where NHK launched an 8K service in December 2018 and plans on covering the entire 2020 Tokyo Olympics in that format. CTA projects sales of 1.5 million 8K sets in the US in 2022, leading me to wonder what happens when they saturate the market. CES 2024 is going to need something to get everyone to upgrade, and 3D has already failed to be a decisive factor. Moving beyond boring, two-dimensional reality, augmented and virtual reality technology continues to improve but hasn’t found the killer reason to be widely adopted. VR is heavily fragmented by competing standards and devices—and if you don’t have a pricey Windows computer, you’re not even in the market. The need for that horsepower requires VR to be in a dedicated room of your house, close enough to the computer for the cables to reach, but with enough free space so you don’t break your leg in physical reality while wandering a virtual one. 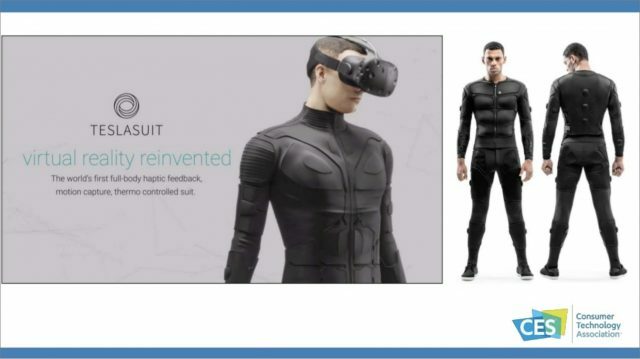 One company is demoing a full-body haptic suit this year, but CTA’s mention of it didn’t sound very appealing: “When someone punches you in the gut in Red Dead Redemption 2, you’ll feel it.” Great. Sign me up. More promising is the prospect of VR theme parks where people can try varying experiences—and yes, Japan is where the first ones will be. Augmented reality, which creates heads-up displays over actual places and things around you, is more obviously useful, and this year more AR headsets are looking like sunglasses rather than wraparound headgear that Darth Vader would reject as too baroque. You’ll also see AR in some standalone uses, such as retail stores with AR mirrors that allow you to see what clothes look like on you more quickly than trying them on. My expectation regarding personal AR is the same as last year: eventually, Apple is going to sell us $1000 AR glasses, which will be powered by the $1000 iPhone in your pocket. You’ll need both because no headset can contain the breakthrough visuals, the CPU horsepower, and the necessary batteries. And Apple will have its next category-defining device to put on the museum shelf next to the PowerBook, iPod, iPhone, and iPad. If it’s not Apple, it will definitely be someone, because AR is too obviously the way we’re going to mediate the world in the future. Walk into a museum and see historical data projected over anything you see. Check the menu of the restaurant right in front of you, or use “X-ray vision” to compare it to another one a block away. There will probably be kiosks doing blockbuster business selling these devices in front of every sports stadium. Autonomous vehicles are the next technology that’s perennially just a few years away—but one of these years, it will surprise us. 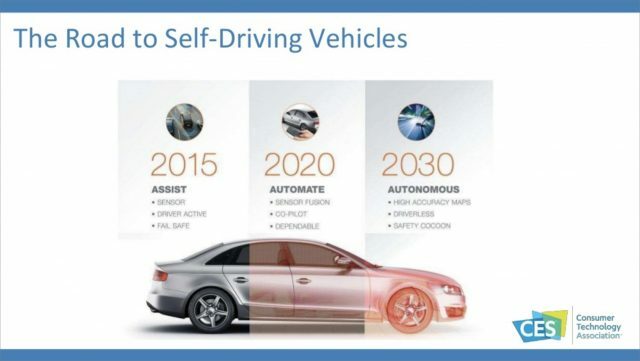 CTA projects that by 2020, most cars will be “conditionally autonomous.” You’ll still drive your car, but it will be paying attention—and when you get distracted and don’t notice the car braking in front of you, it’ll temporarily take over the entire car: brakes, steering, and all. 2030 is CTA’s target date for when you’ll never touch a steering wheel again. But that means we’re about to reach an uncanny valley. It’s perfectly normal for your car to be dumb and for you to be its only smarts, and someday it will seem normal that your car takes you places. It’s in the middle when people are going to balk. If your car is watching you for bad driving, do you really want to have concrete evidence you’re not as good a driver as you think you are? Will you trust your car not to tell your insurance company? If you think that people will blithely allow their cars to save their lives, note the number of people terrified of flying who are comfortable on statistically much more dangerous roads. Meanwhile, we may soon have to retire one of our favorite complaints about the future not being what we were promised: “It’s the 21st century, where are our flying cars?” Three companies have emailed me saying they’re demoing exactly that this year—turns out, if you can design them around autonomous pilots, you’re less worried about liability issues when your human pilot customers fly into mountains. One company expressly plans to market these on the Uber model: you’ll never own one, but cities will have fleets of them available for trips. I expect autonomous ground vehicles to be equally disruptive—when you never drive a car, you’re less likely to own one, and when far fewer people in cities own cars, suddenly a lot of insanely valuable real estate currently covered with asphalt will become available for repurposing. We might get the first indications of whether I’m right in 2019 because self-driving taxis will be taking to the streets in San Francisco, San Jose, and Washington, DC. The presentation wrapped with two fascinating categories but failed to provide much detail. There’s a lot of medical tech being announced this week, in either the category of how your Apple Watch can tell you about your heart, or actual home care technologies that now require a doctor’s visit. For the first time, CTA is launching a continuing medical education course that doctors can take for the annual hours they need to keep their licenses. And there’s an entire track here dedicated to resilient infrastructure: technologies that will allow governments to maintain communications during disasters, fix damage faster and provide better information to people in bad situations. For consumers, you’ll be able to buy devices that will keep your other devices powered and connected even when the grids are down. The individual product announcements I’ll be covering will be much more down to earth, but should I spot any trends on the show floor that either reflect what CTA had to say or demonstrate new ones, I’ll let you know.